Cucumbers are not only a crunchy, refreshing topping for a salad, they can be made into a healthy juice that fits into your weight-loss plan. Juicing fresh cucumbers in a blender will let you keep the dietary fiber content of the vegetable, making it an even more nutritious beverage. A 1-cup serving of sliced cucumber blended with 1/2 cup of water will make a 1-cup serving of cucumber juice. 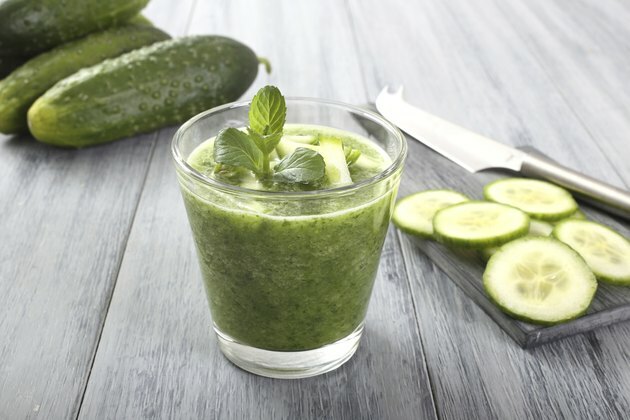 A 1-cup serving of cucumber juice has only 16 calories per serving. A single pound of body weight is equal to 3,500 calories, so to lose one pound, you need to have a loss of 3,500 calories either by consuming fewer calories or burning more. Drink low-calorie cucumber juice in place of higher-calorie beverages, such as soda. In contrast, a 12-ounce can of lemon lime soda has 151 calories per serving. Drinking cucumber juice instead of soda once a week could help you lose two pounds of body weight a year. Cucumber juice is naturally rich in water. A 1/2 cup of room-temperature water equals 118 grams of water, while 1 cup of sliced cucumbers has just over 99 grams per serving. This means a single cup of cucumber juice has 217 grams of water, or almost 7.5 ounces, of water. Water is key for weight loss, according to a study published in "Obesity" in 2010 in which adults consuming extra water lost 2 kilograms of body weight more than those who did not. Adequate hydration is also key to overall health, with MedlinePlus advising six to eight cups of fluids per day. While pure water is recommended, other drinks, such as juices, can also help you meet daily intake needs. Cucumber juice can help you meet your daily vegetable requirement as set by the U.S. Department of Agriculture. The recommendation is for 2 to 3 cups of vegetables per day. A healthy balanced diet is key to safe weight loss. T achieve this, the Centers for Disease Control and Prevention recommends that you consume fresh vegetables, such as cucumbers and cucumber juice, instead of canned vegetables, which may be high in added salt. Drink cucumber juice on its own, or mix it with other vegetable juices, such as beet or carrot, for sweetness. Add a bit of chili powder to the cucumber juice for a spicier drink that is still hydrating and refreshing. Chili powder contains a compound called capsaicin, which can help with lipid oxidation and increasing your energy metabolism, according to a study published in a 2006 issue of the "American Journal of Clinical Nutrition."